Then, I resigned from my job, packed a few suitcases with essential belongings, and hugged my dearest friends goodbye. I flew out of Providence on the evening of December 22rd, 2015, unemployed and somewhat fearful that I would later regret my decision. Sounds like I had it together, right? Wrong. When my plane landed, I was a wreck. What was I doing? I finally had my life coming together out in cold and snowy Providence. I had a boyfriend, an irreplaceable friend group, a job at a chill cafe with a promotion offer, and a rusty apartment that I took great pride in transforming into a home. One of the most stomach churning parts of flying into a new city is the moment you step through the automatic doors of the terminal onto the concrete of a place you haven't been in a while. I felt the warm California air hit my cheeks and I couldn't wrap my head around the fact that I'd spend the winter surrounded by swaying palm trees and not even one snowflake. The night I flew into LAX, my mom invited my best friend from middle school over to my house to help me overcome the depression that undoubtably comes with sudden, unwanted change. I didn't say much, and I'm pretty sure I hardly looked up front the ground. How rude of me. 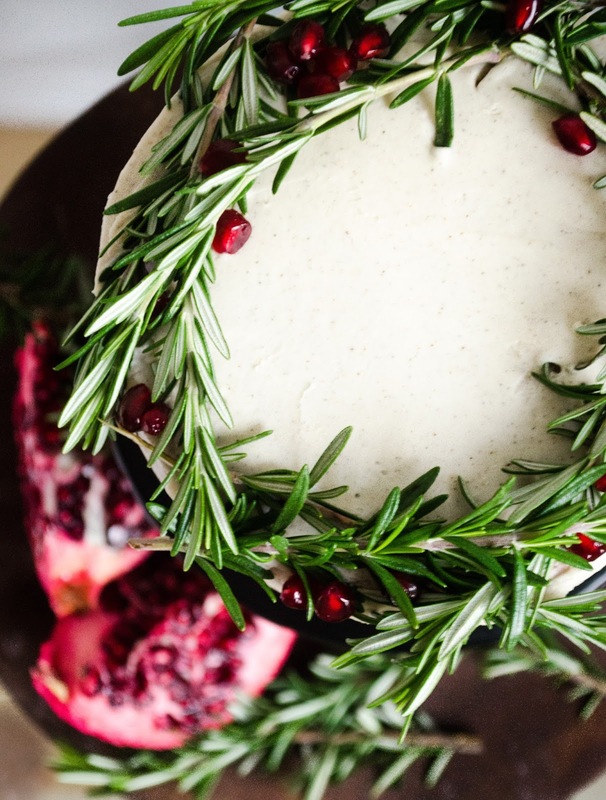 It was the holidays, the most wonderful time of the year, (for some). I was showered in good-to-have-you-back hugs from family. I was also told that I "didn't look like a Californian anymore," which certainly helped with making me feel like I belonged here.. I spent the final days of December de-cluttering my life (one of the goals I made on the plane). I filled donation bags with all my old stuff and pushed my bed against the wall to make room to breathe and a place to lay my yoga mat. I also applied for jobs in Los Angeles, San Fransisco, Denver, and Seattle. I made a routine out of packing my suitcase and kissing my dog, Cassie, goodbye before traveling out of town for a job interview until, finally, I landed an offer at Intelligentsia in LA, where I've been happily working for almost a year now. 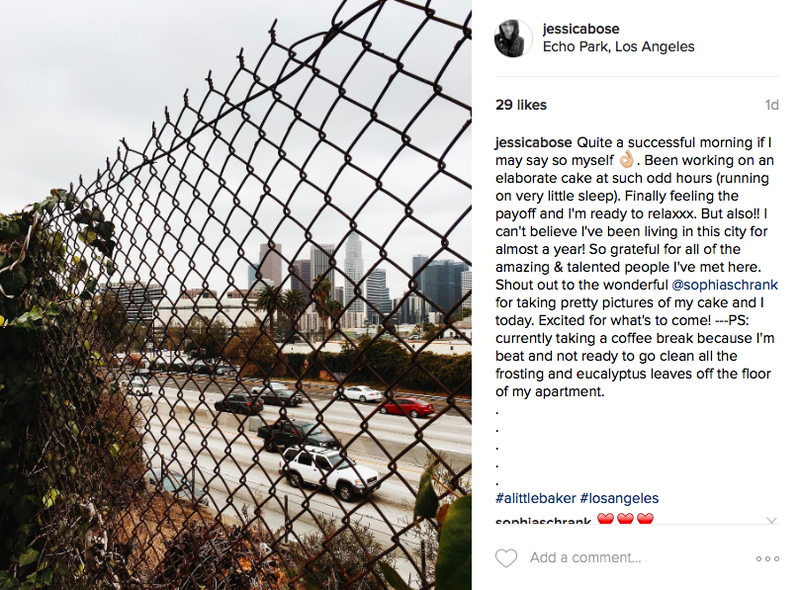 I relocated to LA in January of 2016 and "couch surfed" until I moved into my apartment in February. This is also when I started my first freelance job. I slowly obtained some furniture for my apartment, where I keep my favorite and necessary objects, thus implying that I am living pretty minimally. I somehow managed to make friends despite my awkward and nervous personality, oh, and I'm pretty sure I "look like a Californian" again thanks to my denim jacket complete with my cute little beet pin from Shiny Apple Studio. because that's one thing I haven't managed to do much of this year. As the month of December continues to fly, I've been extremely busy trying to maintain my health, my work schedule, and my social life. I've just received word that Christmas is next week and I haven't even thought about gifts yet, help!!! Somehow though, I did manage to have time to make this cake with a bottle of apple brandy that was up for grabs in the back room at work (there's more to that story, but I'll spare you the details). 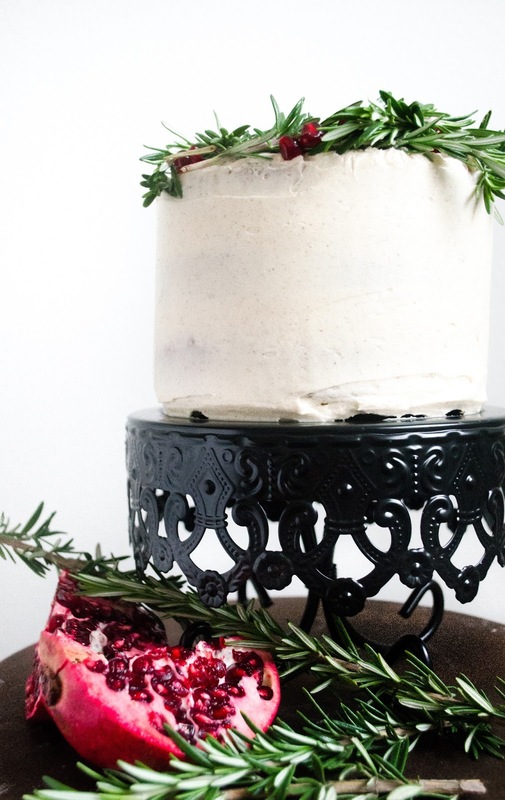 This cake is an adaptation of The Vanilla Bean Blog's spice cake with cardamom coffee frosting. I added some brandy and removed the coffee from the icing. 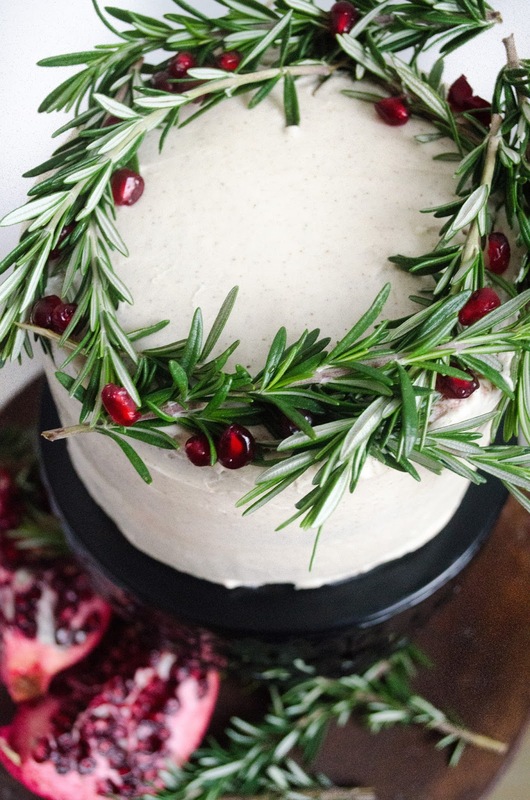 The top is decorated with rosemary and pomegranate seeds. 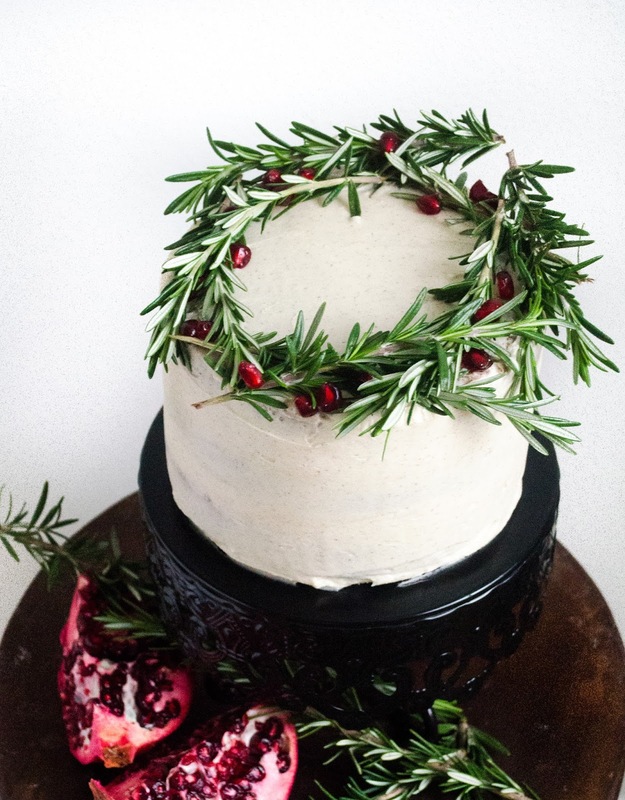 If you do the same, please make sure the people you share the cake with keep the rosemary for later! It's still in perfect condition for cooking after a quick wash! 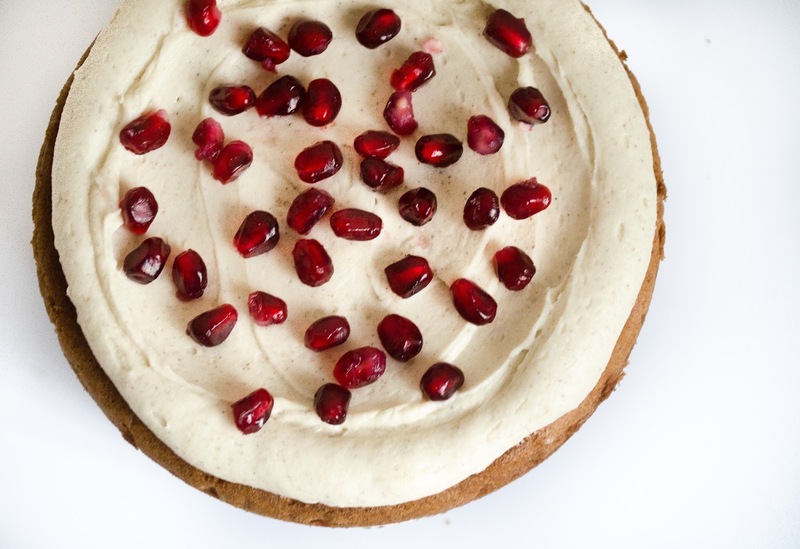 Lately, I've been completely obsessed with pomegranates, hence part of the reason why there's pomegranate seeds in the filling along with the decoration on top. Here's a small piece of advice before I leave you with the recipe: you can de-seed a pomegranate mess-free by cutting it in half and prying it open in a bowl of water. The white membrane will float and can be skimmed off the top of the water. Then, all you have to do is strain the seeds and you are ready to rock n' roll, pomegranate style! In a medium bowl, combine the sifted flour, baking powder, baking soda, salt, cinnamon, cloves, cardamom, and black pepper. In a large mixing bowl using an electric mixer, cream together the butter and sugars. Then, add the eggs one at a time. Add vanilla and mix until creamy again. Beat in the flour alternately with the buttermilk/brandy, beginning and ending with the flour. Continue mixing until the batter is smooth. Evenly distribute batter into prepared cake pans. Bake for 25-30 minutes or until a toothpick into the center comes out clean. Remove from pans and place on a cooling rack until completely cool. 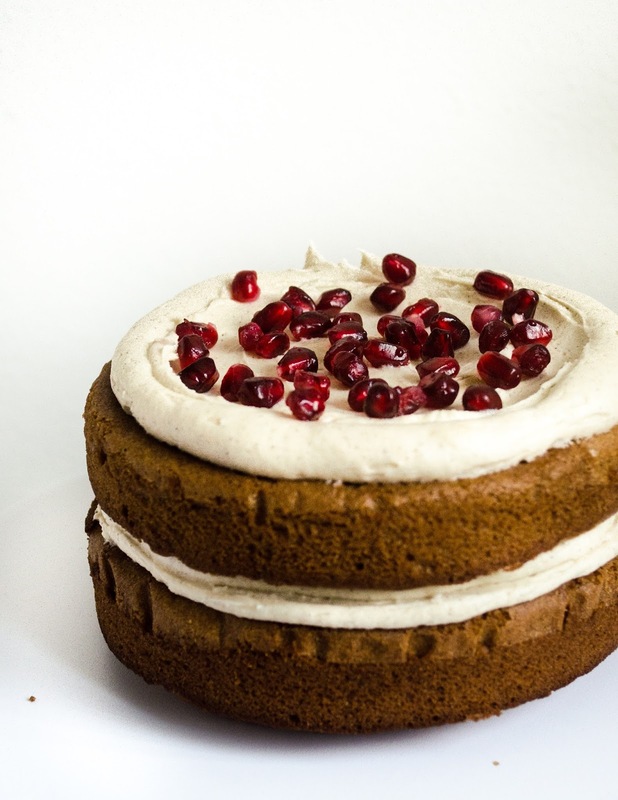 Trim the tops of the cooled cakes and fill with frosting and pomegranate seeds. 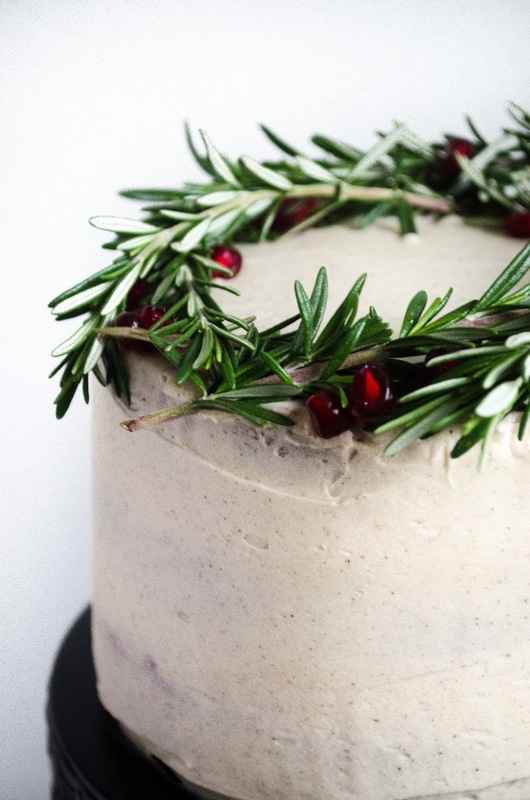 Then, cover the outside in frosting and top with rosemary and more pomegranate seeds. * For this recipe, I made my own buttermilk by combining almond milk with one tablespoon of white vinegar. You can do the same with cow's milk. 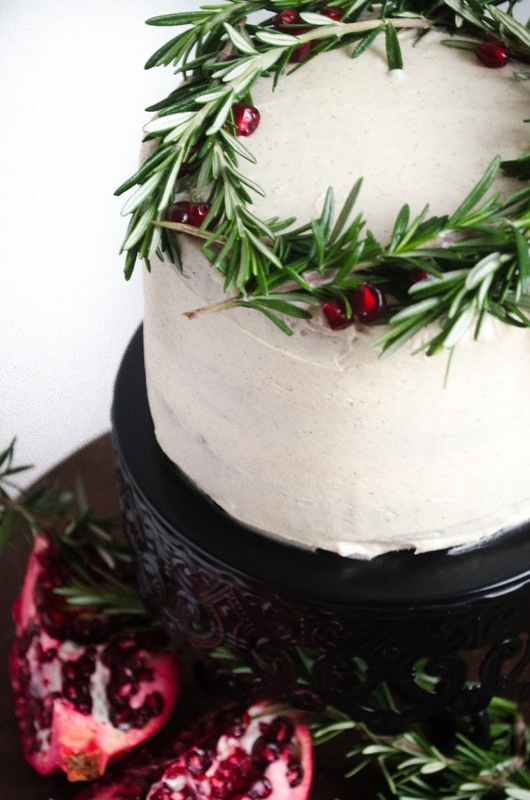 * I like to use heavy whipping cream in buttercream because it makes the frosting easier to spread. However, you can surely substitute regular milk. 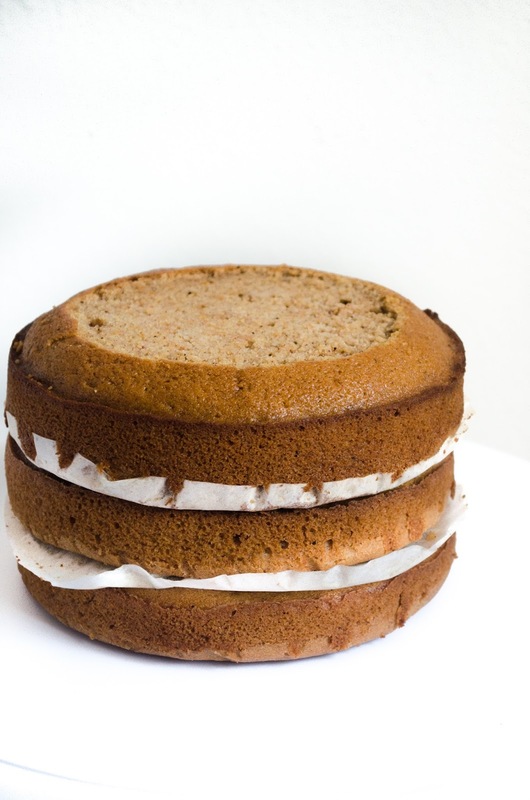 * I only have two 6-inch cake pans, so I baked two layers and then used the same pan right after to bake the final layer. 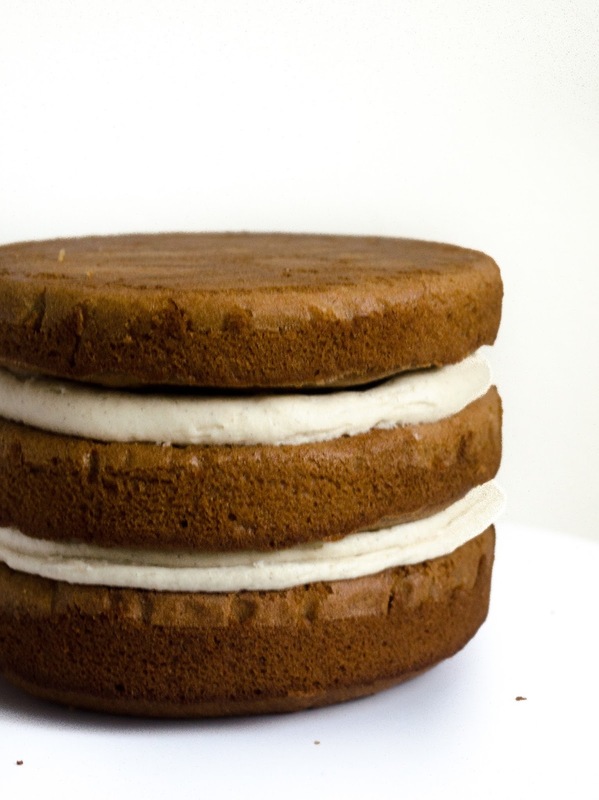 * If the frosting is too thick, add a little more heavy whipping cream. If it is too watery, add more powdered sugar.